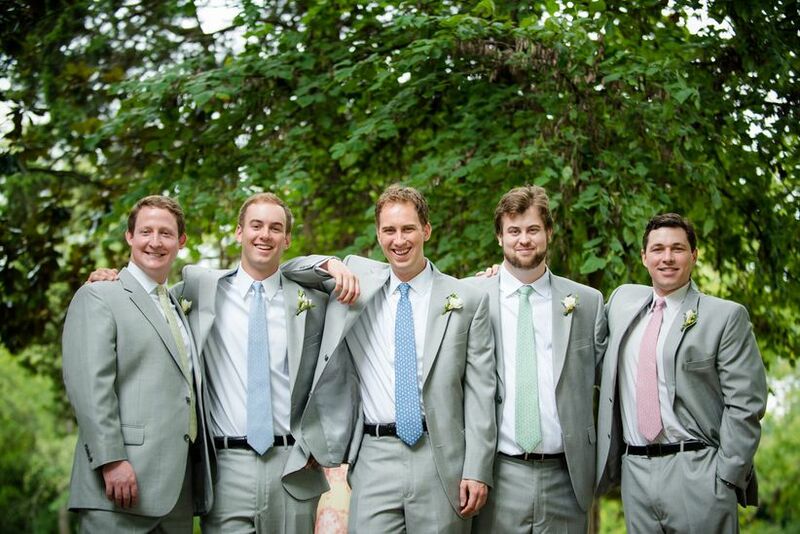 Your groomsmen don't have to wear the exact same thing to look like a cohesive group. Follow these mismatched groomsmen styling tips for a unique, but still relatively uniform, look. For years brides have been allowing their bridesmaids to choose their own bridesmaid dresses, mixing and matching looks to best suit their own personal style. And now it’s the guys’ turn to get in on action with mismatched groomsmen outfits. While formal weddings will stick with a uniform look, less formal affairs will be more adventurous. 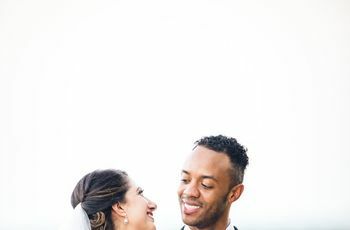 “In non-traditional weddings, where the couple may be more on the creative side or fashion savvy, it is more common to see mixing of looks within the wedding party,” says Donnell Baldwin of Mr. Baldwin Style, a fashion styling and production agency with an emphasis on personal styling for grooms. 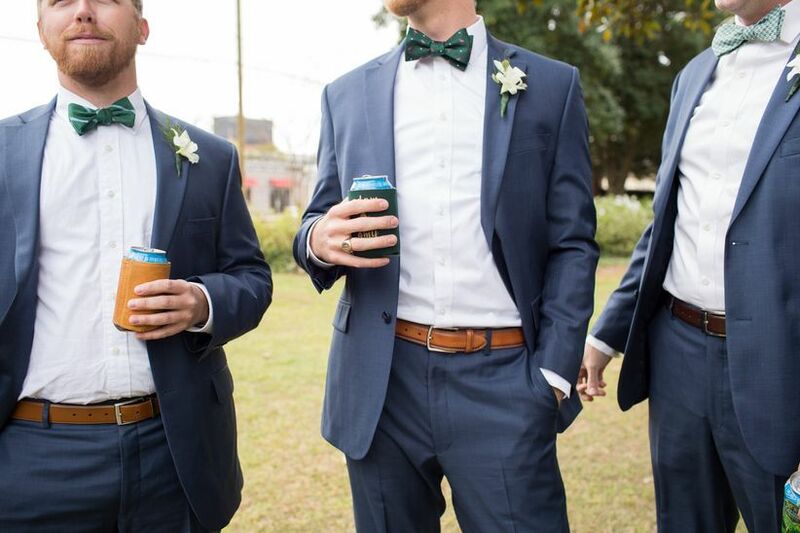 When mixing and matching the wedding party’s look, it’s important to ensure they stand out as groomsmen and don’t look like a guest at the wedding. 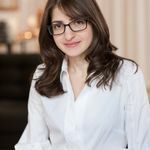 “My advice would be for the groomsmen to at least wear one item or accessory that keeps their look uniform,” says Julie Sabatino, a bridal fashion stylist and founder of The Stylish Bride. 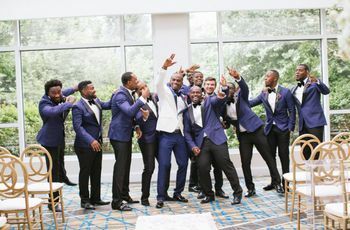 Julie suggests that the groomsmen all wear the same tan pants with different colored jackets, their own suits with the same tie, and any suit with a boutonniere. And if the suits will all be the same, a creative pair of socks can be how each guy expresses himself. 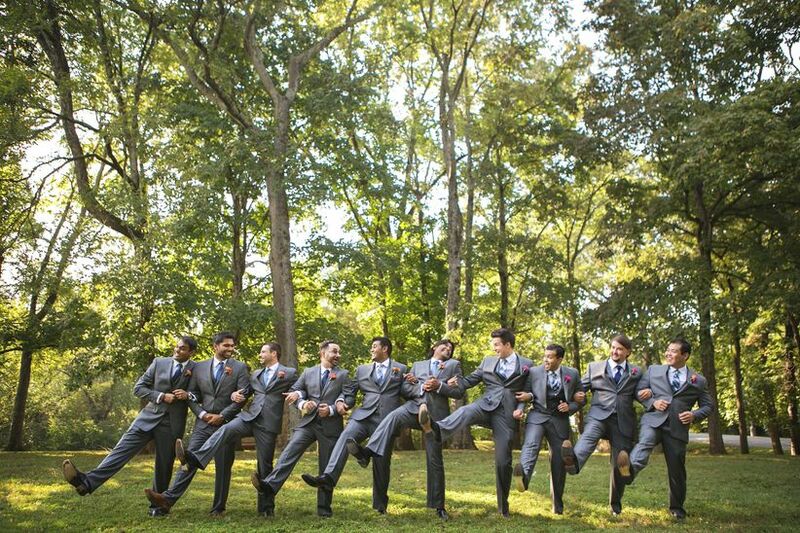 Follow these tips to create stylish mismatched groomsmen suits for the guys in your wedding. Groomsmen should mimic the groom’s style. If the groom is wearing a formal tuxedo, then the groomsmen should be too, but that doesn’t mean they all have to dress the same. “We are seeing an increasing number of wedding parties shaking up the traditional groomsmen uniform by contrasting with the groom or each other,” says Dean Handspiker of INDOCHINO. “It adds an interesting dimension to the overall style of the wedding. If you’re going formal, don’t go overboard with the mixing. “I’ve always encouraged, from a tuxedo perspective, the groomsmen wear one they own, because it will look better than a rental,” says Julie. 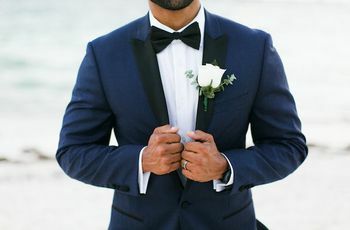 “I ask them to wear the same bow tie and shirt to create a uniform look.” Joseph from Men’s Wearhouse suggests one way to differentiate suiting for a formal wedding is for the groom to wear an ivory dinner jacket with black formal pants and the groomsmen to wear black tuxedos. Suit color and fabrics should match. Mismatched groomsmen suits can be done successfully but you should consider the color and material before giving the guys the okay. Brice explains that mixing suits should be done in a subtle way. If the theme is navy or grey suits, you might know some of your guys already own a similar option. Let them wear it if it’s generally the same material and color you are asking everyone else to wear, he suggests. The same concept applies to tuxedos, shoes and shirts. “Consider what your buds already own. It’s the thoughtful, practical move,” he adds. Let each groomsman pick the most flattering jacket for his body type. Just as the women may choose different silhouettes and necklines to best fit and flatter their figures, the guys may each want to select a tuxedo or suit jacket that compliments them. Dean, Vice President of Design at INDOCHINO, says that guys can customize their jackets, each choosing the best fit – double breasted or single – but still “matching” in the use of the same fabric and colors. “Customizing details such as collars, vents and linings can be details left up to the groomsmen. It’s important there is harmony in the colors used across the groom’s side.” It’s important to note that colors can either match exactly or complement one another. Accessories are a great way to personalize the looks. A man can accessorize his tuxedo or suit in any number of ways: Tie or bow tie? Vest or cummerbund? Pocket square or boutonniere? These are a few of the stylish options the guy’s can choose from. Once a bride or groom has given their okay to which accessories can be worn, groomsmen should pick items that reflect both their personality and style. “Groomsmen can use color in accessories to personalize their look like a silver tie or polka dot pocket square,” suggests Joseph. “There should be no surprises on the wedding day and the couple should be able to maintain creative control of how the mismatched groomsmen suits will complement the overall style and theme of the wedding,” says Courtney Arrington-Baldwin of Mr. Baldwin Style. 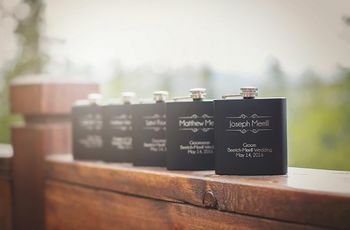 Just as a bride will advise her bridesmaids of the color or colors and dress length they can wear to the wedding, the groomsmen should also receive similar rules to follow. “Guidelines are a must to achieve a coordinated look starting with the fabric choice, and including the belt, shoes and accessories,” explains Dean. The couple should decide how much freedom each guy has in choosing his look for their wedding and make clear what suiting options and accessories will or won’t be allowed. “You want to avoid having someone’s ‘stylish' boots steal the focus in wedding photos and you don’t want to have that conversation on your wedding day,” he adds. And when allowing groomsmen to wear their own shoes, Brice suggests asking for a photo of the pair they plan to wear to your wedding. Make sure they’re not cracked and don’t be afraid to ask them to give them a good polish, at home or professionally.